The theme of the Wine Industry Financial Symposium this fall was “Let the Good Times Roll,” but the news stories that came out of the two-day gathering were as much about potential threats as golden opportunities. “Wine has nothing to fear but beer itself” is a typical example. No individual speaker focused specifically on craft beer and cider, but it’s fair to say that they were the 300-pound gorillas in the room. The reporters present picked up on a comment here and a mention there and effectively connected the dots. Let the good times roll? Or roll out the “beer” barrel? Hard to tell which was the stronger message. I was one of the dots along with UC Davis dean Robert Smiley and others. I spoke about the trends I have observed traveling the world in the past year and one of them is the rise of craft beer and cider and their growing incursion into the wine space. I see it everywhere and the people I meet are often surprised that it is a widespread phenomenon. I thought it was just something that’s happening here is a common response. As if to illustrate my point, the post-conference reception featured a number of nice wines from Napa area wineries plus a Napa-based craft brewer who was pouring three or four interesting products. Can you guess what many of the wine people were drinking? You guessed right if you said that it was beer. Which makes sense because sometimes the best wine is a beer (or a cider). That’s not just a fact of life, it’s also the title of a chapter in my next book, which is set for release next fall. The book is called Money, Taste & Wine: It’s Complicated and it’s a collections of essays, rants and raves about the crazy business of wine. The gist of the chapter (and part of my remarks in Napa and also later in London at Wine Vision 2014) is that inexpensive generic wines can be pretty uninspiring in a world where upscale consumers look for distinctive products like they find at Whole Foods and see on Food Network shows. For about the same price as that generic wine you can purchase a really distinctive craft beer or cider. And while the best wines can cost hundreds, the top of the craft beer category is not that many dollars above the middle market. The relative cost of really distinctive products versus generic plonk can be much less for beer than for wine. In other words, if you want to feed your terroirist soul, you might find craft beer or cider a very cost effective alternative to wine. Obviously I develop this idea more thoroughly in the forthcoming book chapter, but I think you probably get the idea already. Just go to an upscale supermarket and stare at the beer case and cider shelf for a while. You may be impressed by the sophisticated products you see and the reasonable (compared to wine) prices they fetch. I’m especially taken with the new ciders I’ve encountered. Ciders come in many types — blends, single variety, oak-aged and so on. 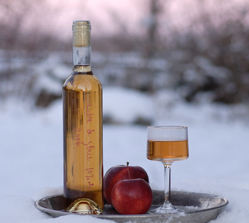 There are even ice ciders that, like ice wines, are made from naturally frozen fruit. Beer and cider also have a number of supply side advantages over wine. Because grains and apples can be stored for months you can make batch after batch of beer and cider pretty much continuously through the year. With wine you get one shot at fermentation and that’s it. This gives beer and cider more production flexibility and permits small lot seasonal experimentation, too. So should wine “fear beer” as the story headline suggests? No, but wine needs to take these products into account and respect them as strong competition. Honestly I don’t think craft beer and cider are threats, but I do see them as challengers. If we don’t want to lose customers to these innovative products, we need to up our game and make sure that wines at key price points have the quality to compete. I enjoy reading your blog posts and particularly those with compelling industry data. I was wondering if I could arrange a meeting with you to introduce myself? Having worked in the wine industry for 23 years here in the USA and Europe, I think I may have seen it all (well, a lot of “it”). The last 10 years I worked for Michael Mondavi at FOLIO Fine Wine Partners, and prior to that Robert Mondavi, Trinchero Family Estate, and got my start in this business with E&J Gallo back in ’92. I recently left FOLIO to found DrinkSpace, a sales & marketing agency for the alcohol drinks category. The epiphany was in 2012 with 1183, the new craft distilling movement, and quite frankly the proliferation of brands across all alcohol drinks categories. Something had to give. As an economist I am sure you are fascinated by the ever populating space that is “boutique” and “craft”. Short of calling ourselves angels, my business partner and I here to help small & mid-sized producers develop their brand strategy, essence (of their existence), and their footprint regionally & nationally. I feel very strongly about what we are doing. I live in the Seattle area and would love to catch up with you for a coffee, or a glass of wine (or other favorite adult beverage).